I especially enjoyed the character and plot development of this book. It is the perfect "epic" story for MG readers: awesome storyline and set-up for following books, but not so long as to be intimidating to middle readers. 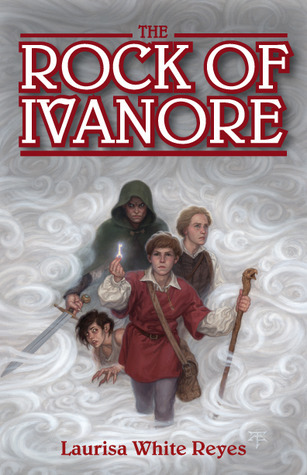 If we could take the tone of Lord of the Rings and make it 10-year-old friendly, we'd have The Rock of Ivanore. The characters are what totally make this story shine--especially Xerxes, the talking, walking-stick. Love him! Every one of the boys is individual and likable, with unique traits that add something to the overall storyline. I love the pacing and world building and easy readability. This is the perfect choice for middle grade fantasy lovers! To help spread the fun of this new adventure, I will randomly choose one winner from the comments (must be a follower of this blog) to win my ARC. Good luck! This one is right up my alley. Thank you for the giveaway. You had me at Lord. Of. The. Rings. Lovely! Thanks for telling us about this one. I'm on the look out for good MG stories at the moment. I've really been falling in love with middle-grade books. And I love fantasy. This books sounds wonderful! You've got me so excited to read this. I have an ARC for an interview with Laurissa so let someone else win. thanks for the great review. Did I read that right-- a talking walking stick? Wow, talk (and walk) about being inventive!! Thanks for the review, Shannon. I love the idea of a Lord of the Rings-style book that is a bit more accessible for the MG audience. A "talking, walking-stick" sounds fantastic! What Are the Middle Grade Taboos? How literate are your characters?